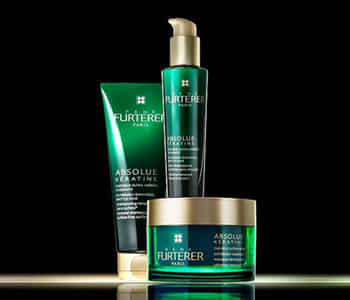 Transform your hair with the Rene Furterer Absolue Keratine collection, a range of intensely repairing haircare for extremely damaged and brittle hair. Created for those who have had chemical treatments or use heated tools, each product in the collection will deeply penetrate hair strands to provide strength, support and protection against further damage. At the heart of each Absolue Keratine formula is a rich infusion of plant-based keratin from soybeans, which supercharge your hair with strength and vitality. From the very first application and with continued use, your hair looks and feels healthy and strong, with enhanced shine and bounce.